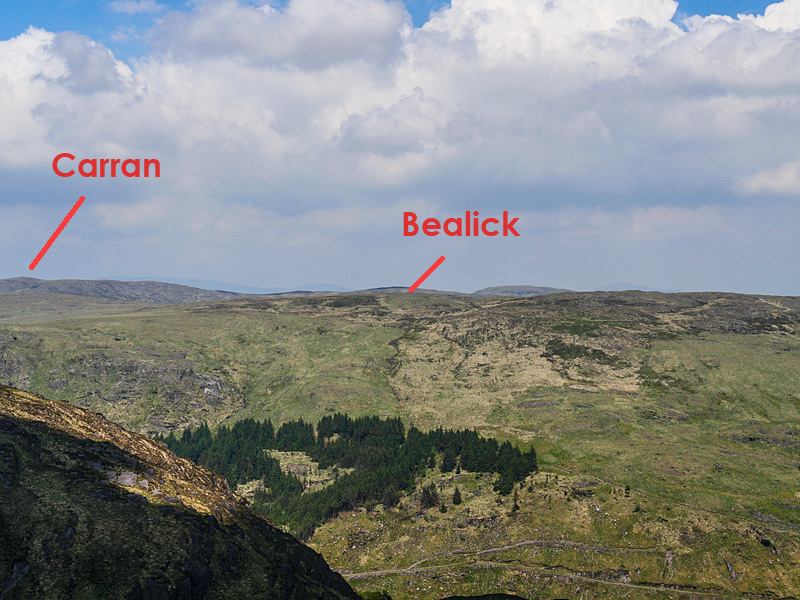 Bealick is the 452nd highest place in Ireland. Small bump on a near level boggy ridge. Gougane Barra access: Park in Gougane Barra at the western most carpark shown on OSI sheet 85 at grid ref W070653 A. Note there is a €5 all day parking charge, automated barrier, coins only accepted. Follow the Gougane Barra Trail steeply uphill to the north from the car-park. After about 600m the trail breaks clear of the forest and turns right. Stay on the trail to its high point about 80m further on. You should then pick up a faint intermittent track heading north to the ridge. Conditions underfoot are good on the track but expect long tussocky grass elsewhere. There is no distinct summit. Best bet is to head for the fence T junction at W07077 66510 B where you are within a stones throw of several likely contenders. Approximately 1.7km, 270m ascent from carpark to summit taking about 45 mins one way. (Carpark to Carran Far North return trip 6 hrs. ).